Progress is a beautiful and scary thing. With progress comes new innovation and a new way of life. In This Will All Be Yours, a new musical by Laura Pederson and Charles Bloom, progress threatens the Price family farm as the old way of living is no longer profitable as a young man, with an eye for the future, attempts to buy the property all while the Price children are growing up and moving on. 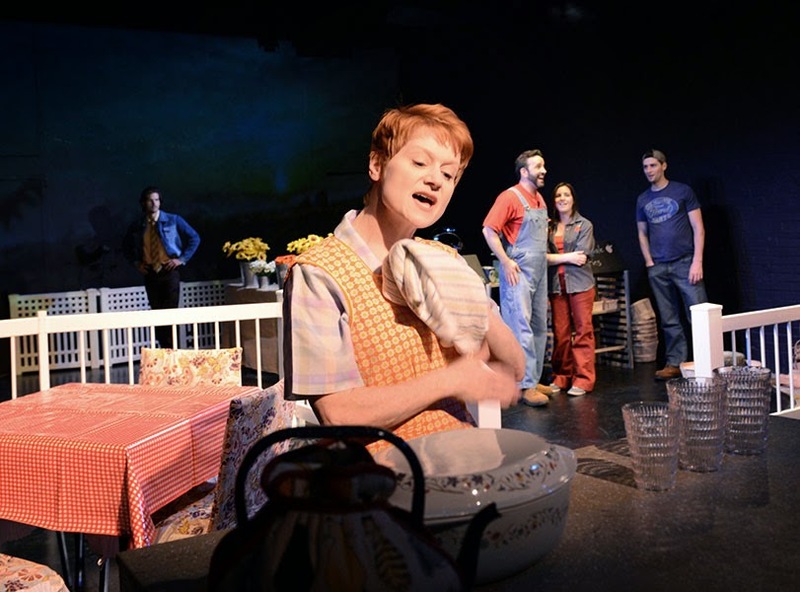 In This Will All Be Yours, Adam and Paula Price hold onto their old-fashioned values and ideals as they tend to their farm along with their three adult children, Glen, Kelly, and Scott. The kids, who've grown up during a time of progress, all have ideas for their future that don't involve the family farm. Though their parents are happy to let their kids fly free, holding onto tradition is still in their hearts, despite young business man and family acquaintance Jackson Webb tries to strike a deal with Adam for the land. At the heart of the musical is the story of family. Watching the family's love and devotion for one another is beautiful. However there is more to a musical than it's heart and intention. This Will All Be Yours is an ode to the classics, clearly inspired by the Rodgers and Hammerstein cannon as well as some more recent pieces in the similar classic style like The Light in the Piazza and The Bridges of Madison County. Like the characters in the play, progress is occurring in musical theater. The classic style musical is sadly becoming a thing of the past, making this new musical feel too old. The score by Charles Bloom lives primarily in the ballad and mid tempo world. The musical longed for something upbeat, though Jackson's "Progress" fit that bill. While the score did have some stunning numbers including Kelly's "The Sky and I" and Scott's "Being a Star", overall the music felt repetitive. The book by Laura Pederson was, almost to a fault, fully seeded with farm lingo and the like. Due to the language, the dialogue felt quite presentational and unnatural for the actors to recite, especially Amy Griffin and Josh Powell as Paula and Adam. Overall, the entire piece felt like a Disney attraction. You know, like the Carousel of Progress; the attraction tourists flock to in order to avoid the Florida heat. As the Price children, Jenny Rose Baker, Matt Farcher, and Daniel Rowan as Kelly, Glen, and Scott respectively, offered a pretty solid performance. The trio had beautiful voices, Baker and Rowan's the most contemporary and pleasing. Trevor St. John-Gilbert as the smooth talking, plaid suit wearing Jackson developed a wonderful character through his varied appearances. Director Ludovica Villar-Hauser seemed to struggle with this musical world. While the set by Meganne George literally put a fence between the actors and audience, Villar-Hauser lacked intimacy and an invitation for the audience to enter the world. Additionally, her staging included a lot of busy work, with little progress, for the actors. George's set and costumes did evoke the appropriate feel, the disconnect was quite unfortunate. Janie Bullard's soundscape added the necessary feel and atmosphere. For the theater goers longing for the past, This Will All Be Yours is an opportunity to relive the nostalgia. But for a musical about progress, this piece may not progress the genre.